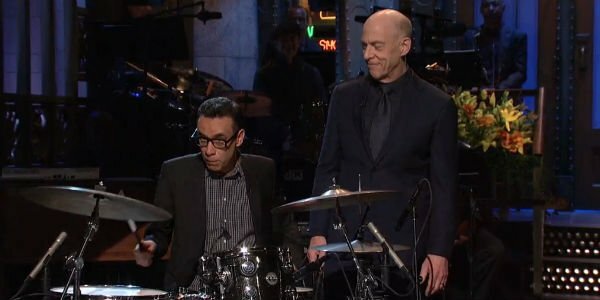 In order to prove that he is not nearly as mean and offensive as his conductor character, Fletcher, J.K. Simmons puts together an opening number with cast members, Kyle Mooney and Aidy Bryant. And while there was no chair throwing, or bleeding on the drum kit, Simmons was far from the ‘nice guy’ he claims. Fletcher came out almost instantly, as Mooney struggled to keep tempo. Simmons used similar language as he does in the film Whiplash telling Mooney, "Kyle, that’s not my tempo." It is the exact same way he started to show his true colors in the film, when Miles Teller’s character gets his chance in the big leagues, and Fletcher goes from comforting to bringing the young man to slobbering tears. There was no crying per se, but there was a sense of fear lingering in the air as Simmons started to raise his voice. "I'm not going to practice 100 hours a week." Simmons brought down everyone. When Leslie Jones hit the stage (and the kit), Simmons didn’t let up. But Leslie Jones called the actor out, telling him to "pump your brakes, dude". And that was the line that introduced the special guest. The man that would finally put Simmons’ Fletcher persona to rest. The one and only Fred Armisen takes a seat in a familiar place. "You know I have an idea. Maybe just be nice. Because drumming should be fun. You know and I think you’re just a little sweetie. I’m going to play something nice for this little sweetie. What do you think about that." Badass drum solo [drops mic]. While this wasn’t Simmons best skit of the night, it definitely was a fun watch. Not only because Fred Armisen completely mocks Simmons character, but also the fact that Simmons, nominated for an Oscar for this role, can also make fun of it in his own way, and finally sneak a smirk in there.